Power your compatible Garmin handheld device using rechargeable nickel-metal hydrid (NiMH) batteries. The battery kit then charges your batteries up when they run low. The kit includes two nickel-metal hydrid AA rechargeble batteries, AAA batteries while also compatible these are not included. The battery charging kit also includes international plug adaptors, enabling you to use the battery charger in the UK, Europe, USA and Australia. Compatibility: Compatible with Garmin Approach G3, G5, Colorado series, Dakota series, eTrex series, GPS 73, GPSMAP 62 series, GPSMAP 64 series, GPSMAP 66 series, GPSMAP 78 series and Oregon series To view a full list of compatible products click here. 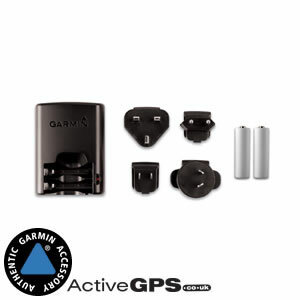 Everything you need to power your compatible Garmin handheld device is included; Battery charger kit includes replacement AA battery, battery charger, AC adaptor and international plugs for the UK, USA, Europe and Australia. What is the rechargeable NiMH battery kit compatible with? Garmin Approach G3, G5, Colorado 300, Dakota 10, 20, eTrex 10, 20, 20x, 30, 30x, Touch 25, Touch 35, Camo, H, Legend, Legend C, Legend Cx, Legend H, Legend HCx, Summit, Summit HC, Venture, Venture Cx, Venture HC, Vista, Vista C, Vista Cx, Vista H, Vista HCx, GPS 72H, 73, GPSMAP 62, 62s, 62sc, 62st, 62stc, 64, 64s, 66s, 66st, 78, 78s, Oregon 200, 300, 400t, 450, 450t, 550, 550.